Whether you're a canine owner or an equestrian, it's a good idea to have Chlorhexidine Solution in the house. Chlorhexidine Solution is a topical aqueous cleaning solution for application to superficial cuts, abrasions, or insect stings. It fights bacteria, fungi, ringworm, and yeast that cause infections. Plus, it's easy to use and apply. Avoid contact with eyes and mucous membranes. This product is not to be used in ears. If contact is made, flush immediately and thoroughly with clean water. Keep out of reach of children. 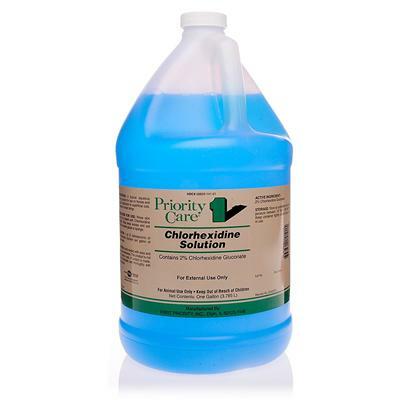 Dilute 1 ounce (2 tablespoons) of Chlorhexidine Solution per gallon of clean water. Rinse skin area to be treated with solution. Wipe away excess and pat dry with a sterile gauze or sponge.